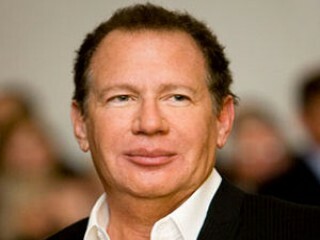 Gary Shandling is an American comedian, actor and writer. He is best known for his work in It's Garry Shandling's Show and The Larry Sanders Show. Shandling began his career writing for sitcoms such as Sanford and Son and Welcome Back, Kotter. He made a successful stand-up performance on The Tonight Show with Johnny Carson and became a frequent guest-host on the show. Shandling was for a time considered the leading contender to replace Carson (other hopefuls were Joan Rivers, David Letterman and David Brenner). In 1986 he created It's Garry Shandling's Show, for the pay cable channel Showtime. It was nominated for four Emmy Awards (including one for Shandling) and lasted until 1990. His second show, The Larry Sanders Show, which began airing on HBO in 1992, was more successful. Shandling was nominated for 18 Emmy Awards for the show and won in 1998, along with Peter Tolan, for writing the series finale. During his three-decade career, Shandling has been nominated for 19 Primetime Emmy Awards, two Golden Globe Awards, along with many other awards and nominations. Shandling was born in Chicago, Illinois, into a Jewish family. He grew up in Tucson, Arizona, the son of Muriel, a pet store proprietor, and Irving Shandling, a print shop owner. He had an older brother, Barry, who died of cystic fibrosis when Garry was 10. Shandling attended Palo Verde High School. After graduation, he attended the University of Arizona, at first majoring in electrical engineering, but eventually completing a degree in marketing and pursuing a year of postgraduate studies in creative writing. In 1973, Shandling moved to Los Angeles, California. He worked at an advertising agency for a time, and then sold a script for the popular NBC sitcom Sanford and Son. Shandling's script became the November 21, 1975 episode titled "Sanford and the Rising Son," in which Ah Chew (played by Pat Morita) turned junkyard owner Fred Sanford's (played by Redd Foxx) house into a Japanese restaurant. Shandling also wrote the script for the Sanford and Son episode, "The Committee Man", in which Fred Sanford represents the community of Watts on the Los Angeles Mayor's Committee. In addition to "Sanford and Son," Shandling wrote scripts for the sitcoms Welcome Back, Kotter and Three's Company. In 1977, Shandling was involved in an auto accident in Beverly Hills that left him in critical condition for weeks. He later turned the accident into part of his stand-up comedy act. View the full website biography of Gary Shandling.